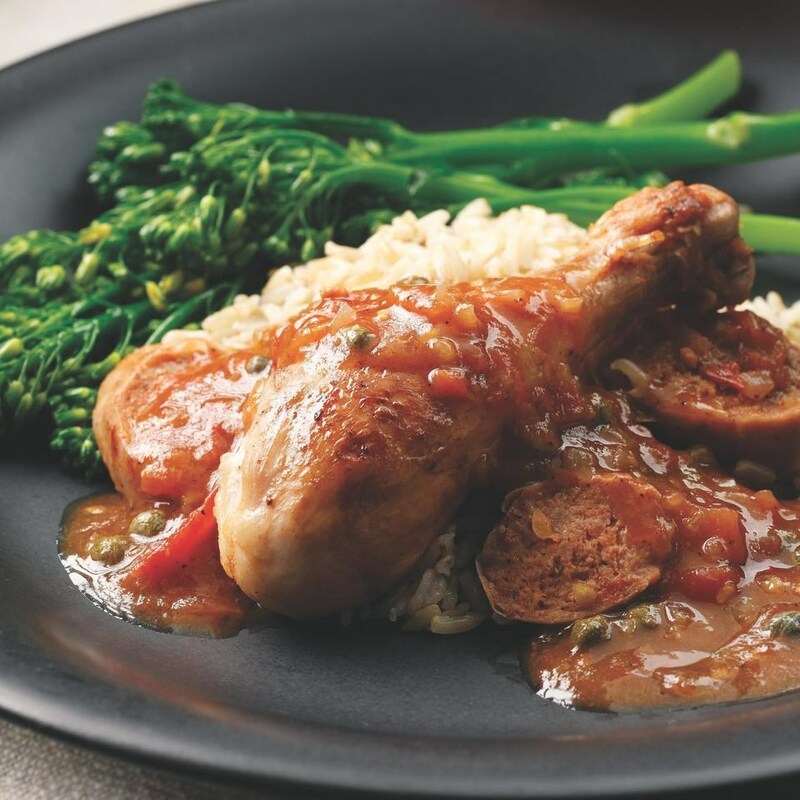 Whole chicken legs, turkey sausage, tomatoes and fresh herbs are a delicious combination in this Catalan-inspired skillet supper. Dovetailing tip: Purchase 3 pounds of bulk sweet Italian sausage in place of the links. Crumble and cook all 3 pounds. Use 1/3 of the cooked sausage in this recipe. Add the cooked sausage to the sauce in Step 4. The remaining 2/3 will be used for Meal 4, Sausage Gravy Breakfast Lasagna. 1. Remove skin from chicken and trim any excess fat. Season the chicken with 1/2 teaspoon salt and 1/4 teaspoon pepper. 2. Heat 1 teaspoon oil in a 12-inch skillet over medium heat. Add sausage and cook, turning occasionally, until browned on all sides, about 7 minutes. Transfer to a clean cutting board; let cool slightly, then slice crosswise into 1/2-inch-thick rounds. 3. Add the remaining 1 teaspoon oil and butter to the pan and increase heat to medium-high. Add the chicken and cook, turning occasionally, until browned on all sides, 4 to 5 minutes. Transfer to a plate. 4. Add tomatoes, garlic, shallot, the remaining 1/4 teaspoon salt and pepper to the pan and cook, stirring occasionally, until most of the liquid has evaporated, 7 to 9 minutes. Add wine, rosemary and thyme and continue cooking, stirring occasionally, for 2 to 3 minutes. Return the chicken and sausage to the pan, turning to coat with sauce. Cover and simmer until the chicken and sausage are cooked through, 15 to 20 minutes. Stir broth and cornstarch together in a small bowl until smooth. Transfer the chicken and sausage to a serving dish with a slotted spoon. Discard the rosemary and thyme sprigs. Stir the cornstarch mixture, capers and lemon zest into the pan; bring to a simmer and cook until the pan juices are thickened, 1 to 2 minutes. Serve the chicken with the sauce and garnish with parsley, if desired.